ST. PETERSBURG, Fla. – The Morean Arts Center (MAC) honors the survivors of sexual abuse with Susan T. Martin: Through the Eyes of a Survivor pop-up exhibition. 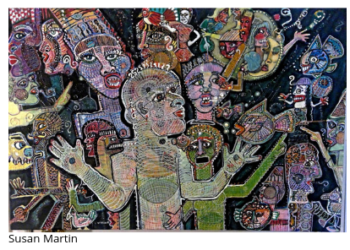 April is Sexual Assault Awareness Month (SAAM) and the MAC presents the expressive, complex works of Susan T. Martin in her very first solo exhibition. Susan is a local artist who overcame childhood trauma, addiction and mental health issues to follow her dream of becoming an artist. Her intricate, biographical paintings convey the triumph of the human spirit over tragedy through courage and faith—breaking the silence. The exhibition will be on view at the MAC April 5 – 28. Opening reception will be held during Second Saturday ArtWalk, Saturday, April 13, 5-9 p.m.
Susan T. Martin is a survivor of violent sexual abuse and for many years suffered in silence, enduring the pain of shame and guilt from a lost innocence. She’s also a working artist coping with Bipolar Disorder, which can cause unusual shifts in moods that effects the ability to carry out normal day-to-day tasks. Art became an outlet for Susan to emotionally release and communicate the words she couldn’t speak. “I am here today to share my art with you, to show you the flashbacks and fears that I have learned to live with successfully”, says Martin. Susan moved to St. Petersburg a couple of years ago from South Florida and soon became a member of the MAC. She began to take advantage of all member opportunities for emerging artists and has remained active ever since. Her work started to attract attention from peers, friends and gallery visitors. She certainly impressed MAC’s Curator of Exhibitions, Amanda Cooper, on many occasions which led to Susan getting her first solo exhibition. “Her art is so powerful. She bares her soul, along with her childhood trauma, on the canvas—yet does it in a way that engages and connects to the viewer instead of alienating and shocking them”, says Cooper. With April being April Sexual Assault Awareness Month (SAAM), Amanda encouraged Susan to display her work in a solo, pop-up exhibition at the MAC. Susan’s emergence as an artist not only reflects the power of her courage to heal her own heart, she also hopes to do the same for other survivors. “I hope to reach the survivors of sexual trauma, to show them that there is hope for a future full of joy and creativity”, says Martin. For more information on the Morean Arts Center and upcoming exhibitions, please visit MoreanArtsCenter.org. About the Morean Arts Center: The Morean Arts Center, with roots dating back to 1917 as the Art Club of St. Petersburg, focuses on an innovative, community-oriented approach to art and art education. The mission of the Morean Arts Center is to connect people with art and to contribute to the economic development of the region. Operating under the Morean Arts Center includes the Chihuly Collection, Glass Studio and the Morean Center for Clay.